These are my new favourite thing. 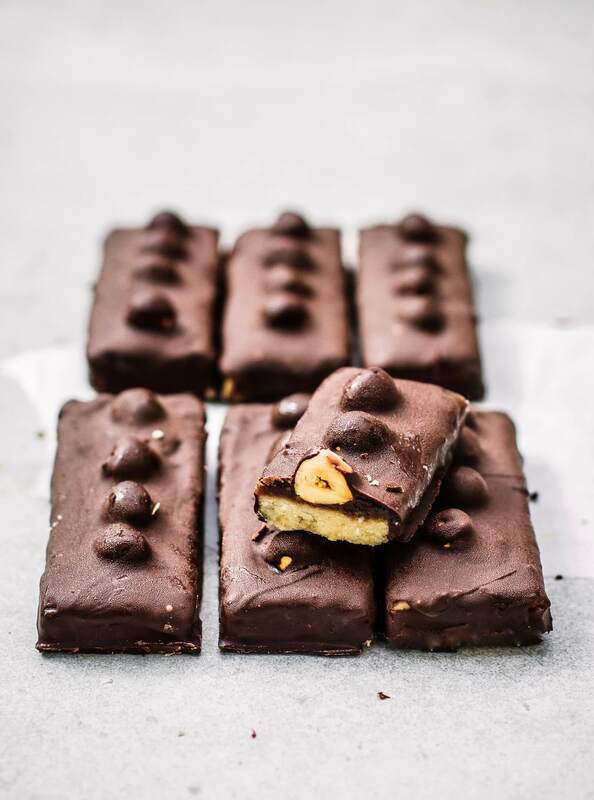 I keep them in the freezer and the caramel goes so perfectly chewy, it’s the best combo with the crunchy hazelnuts, crumbly biscuit base and dark chocolate. They’re like ice cream chocolate bars, but even better. Combine the ground almonds and the salt in a large bowl. Add in the melted coconut oil, maple syrup and vanilla and mix well. You should have a mixture like wet sand. Press the mixture very firmly into an 8×8 inch baking tin lined with parchment paper. Bake at 180’C for about 12 minutes until golden, then set it aside on a wire rack to cool. While the crust is cooling, add the coconut sugar to a saucepan on medium with the coconut cream and stir it until the sugar is dissolved. Add in a pinch of sea salt. Then adjust the heat until it comes to a gentle rolling boil. Leave it like this, stirring every few minutes for about 10 minutes until thickened. Use a fork to whisk in the cashew butter until smooth. Pour it out over the crust and pop it in the freezer until the caramel sets- about 2 hours. While the caramel is setting, roast the hazelnuts at 180’C for about 8 minutes until golden. 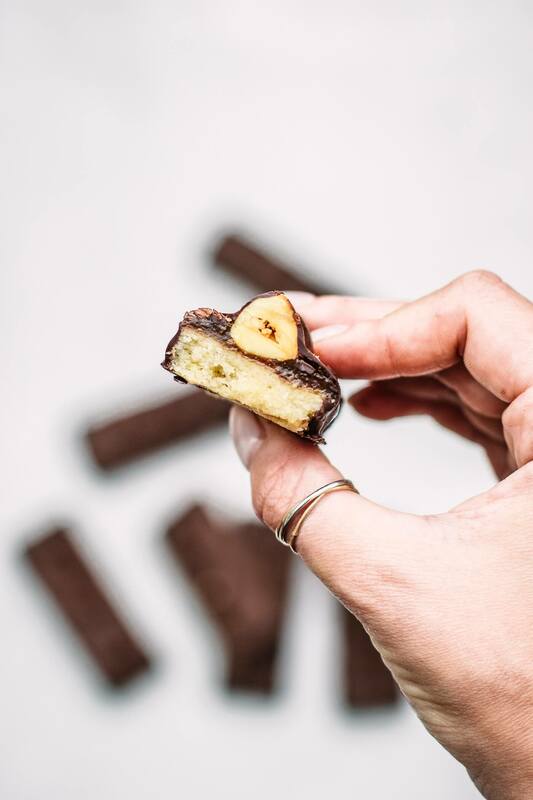 Melt the chocolate and stir in one tablespoon of coconut oil. Take the bars out of the freezer and slice them. Press some hazelnuts into the top of each bar. Coat each bar in the melted chocolate. Put the bars in the freezer for a few minutes for the chocolate to harden and then enjoy! Store in the freezer. Can u use a different milk then coconut milk ? Thanks for this, just made them and they are SO good!